Creating the intention for the unity consciousness of the Ninth Wave of the Mayan calendar! The Mayan calendar is about you. 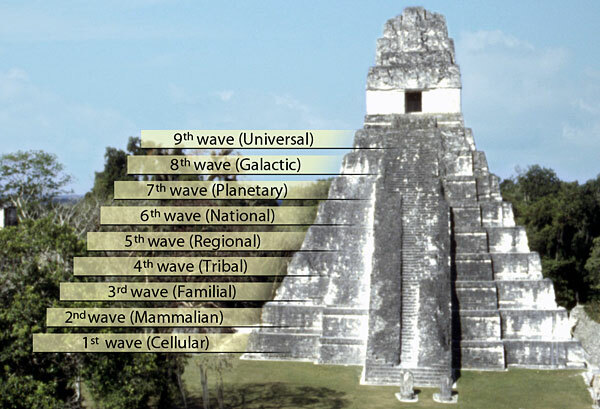 According to the ancient Maya the creation of the universe is effected by nine waves. We are now approaching the end of the eighth wave and, on top of this, the activation of the ninth and highest level that will cap off the evolution of the universe. This ninth level of the universe is designed to generate unity consciousness. The manifestation of the unity consciousness brought by the ninth level will require an intention on the part of the human beings to co-create this. 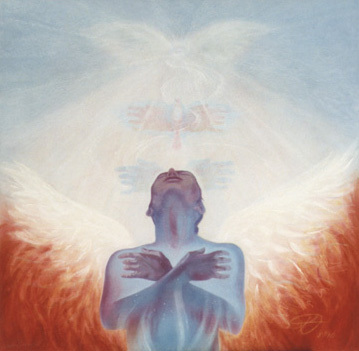 The Conscious Convergence, July 17-18, 2010, is for those that are willing to set the intention to create unity consciousness in the ninth wave of the Mayan calendar system. Following is from Lauren C. Gorgo. I generally relate to Lauren’s views and always enjoy her way of expressing them. Since the last update, we are definitely still grounding, grounding, grounding. Ouch. We are basically being drilled into the earth…hence all the unbelievable leg, back & neck pains… while experiencing earth activations and the opening of major chakras and higher octaves of universal intelligence…all of which is providing us with the option to openly reveal our true nature as fully integrated beings of love. Roughly speaking, in the space of time provided for the finalization of these major activations, many of us will be presented with swift and grand opportunities to align with our next level creations and share our gifts and expertise with the world. In the mere moments ahead… mainly the time cycle that is presenting itself through the remainder of this sacred season of completion (from the equinox until the summer solstice)…those with contracts to serve the higher good in physical ways are quickening and beginning to put their newly acquired universal intelligence into tangible form. From this perspective, those who have had limited access to the earthly dimensions, the grounded energies and applications needed to live a fulfilling life, will be once again in the throes of great earthly support and forward movement. There is a celestial timeline of completion rapidly approaching that will sever all energetic ties to the lower dimensional field matrices for those who have completed their “inner” work. These souls will be freed from disharmonious energies and aligned with the source of greater potential to apply their “inner” work to the “outer” world. Those who have completed the journey into oneness … the forerunners in ascended consciousness…will not necessarily be provided with “rules of conduct” for new earth living, however. (mostly because we make this part up) This is notable because for those of you who have completed the “work”, honored your personal evolution and the sacred laws of creation, you will be progressing at speeds and levels previously unknown to the human experience. In fact, this quickening process may have already begun for you. I am hearing that this information is not to warn or discourage us from forward movement, but to make us aware of how effortlessly and fast energy works in alignment with “right timing” and without karmic resistance in the upper realms of human consciousness. This fast moving energy is the energy of a fully reconnected being. Pretty exciting stuff….well, except for all those lingering physical symptoms…. The next level of creation…the physical manifestation phase…is what we have been tirelessly working toward for so so so freaking long. It is the proverbial reaping of our meticulously cultivated crops. This stage of creation will be an acute reflection of the mastery that we honed through relentless hardship and in many ways, will feel like the next logical step on your journey. This phase gives us the key to unlock the gates to the ripening fruits of all our divine labors. There are many opportunities beginning to surface for us to explore new potentials in physical form… a plethora of new ideas will be gifted to those tapped into the new matrix and through the reunion of soul family, these ideas will begin to quickly materialize in astonishing ways. All this information coming at us can be a bit overwhelming if you are in tune with these surges of creativity. They can come on sudden and strong, so you may find it helpful to rely on the earthy energies surrounding us at this time to keep balanced and at peace with these tidal waves of new and exciting ideas. For the next few weeks there will literally be a multitude of creative endeavors swimming in the hearts and minds of awakened souls everywhere. These ideas will inevitably bring the physical framework and new earth structures into full form and it will be the first wave of participating souls who will have the role of relaying these concepts to the world for the next act in this r-evolutionary play. Each of us has a unique part in this divine play, but the beauty in its creation comes from our ability to write it as we live it…real time creation. This is because there is nothing in place here…no rules, no guidelines, no structure, no format…only the fluid fields of creative potential waiting to manifest through us, into form. The pioneers who will lay the laws of this new land…the purified vessels of Source creation…are the first to have access to it and are arriving now to announce and proclaim our individual visions of this beautiful new earth. As each of us applies our individualized vision of perfection in this fertile soil, we will be awestruck at the rate and ease by which things grow. Right now we are finishing up a particularly arduous and physically painful cycle of grounding and detox, and while learning how to master the application of our new perceptions in the physical world. Everything now is about bringing our point of perceptual awareness to the physical realms of creation and learning how our expanded potential fits into our cellular form. This new framework by which we are learning to operate is familiar, yet new…operational, yet dormant…mundane, yet other-wordily. It is the juxtaposition of these energies that are now merging into one…where spirit meets matter… with the sobering realization that we have come full-circle and that nothing, yet everything, has changed. Our outward life may or may not look the same, but suddenly the eyes we are looking thru are not. This grounding business is almost like waking from a dream by which we were removed from reality and tortured for a decade and then popped back into our life again to make sense of it all. It can be confusing, foreign and strange…you may be wondering “where you have been” and “why you were even on this journey” as you look around you with no connection to what is your so-called-life. Undoubtedly, life is growing increasingly more surreal by the moment…very Truman-show-esque…but this will pass as we settle into ourselves fully. During the early stages of awakening we are deliberately removed from life-as-usual as all of our energy is focused on developing the upper energy centers, expanding our consciousness and developing our higher aspects. As we complete the reconnection phase we drop back down into our lives and bodies and begin to work within the physical dimensions again…albeit with our new and expanded sense of self. This is why it may seem that we are waking from a dream because tho we were on the earth during the last several years, we were not fully participating in it. It will definitely take some acclimating to understand how all of our inner-schooling will apply to the outer-world, right now we just need to take one step at a time and help our still-morphing-bods to catch up. As we begin to practice using our authentic selves in our daily living, things will get interesting…for sure. We will realize that we bump up against familiar situations, people and places…but with a new way of seeing, being and experiencing. We will notice a significant increase in confidence, a surety we haven’t had in a VERY long time…or ever. As we climb back into these changing bodies we are starting to see the magnitude of what we have accomplished…mainly because we finally have a context for it now that we can relate to the outside world. In fact, we are beginning to see this whole remembering-our-divinity game as more real and as a result, those around us will now begin to respond to us in different ways. Because we are becoming more certain and assured of who we are, where we’ve been and where we are going, we will now have a greater impact and believability as the masters we truly are. In other words, we are beginning to really SEE, understand & know ourselves…the whole of who we are…for the first time. This new clarity is also enabling us to understand more fully how others see and relate to us…whereas for the last several years, we were so immersed in the process, we couldn’t see outside of it. We are at a major crossroads…a turning point…and literally bumping elbows with our new lives. Many of us are about to take a serious step in the direction of our long held dreams and heartfelt desires…and once we do, there will be no turning back to the life we knew. Amen to that. This means a lot of “spring cleaning” and practical, down to earth biz…a time to bring old projects to completion and to hone new projects to perfection. It is also a time to harness the multitude of incoming ideas and information (at the very least, write them down) for our new beginnings and the start of a brand new life. A time of review is also upon us with Mercury going retrograde on the 17th and will best be put to use thru reorganizing and restructuring our foundations once more before building the new framework upon it. We are being completely supported to create a radically different life for ourselves…one that is based on the full integration of our authenticity, but very grounded in earthly structure with the blessing of the divine masculine energy here now to support the free-flowing energy of the divine feminine that we have been nursing for so long. Those who will be utilizing the new earth frequency codes for the purposes of enjoying a better way to live will be those who are providing others with the inspiration, scope and understanding of whats possible as a whole and integrated being. We are not only approaching a time of inspired work, but a time of inspired play…a time to make life beautiful and fun again…a time to resort to our childish ways of playfulness, imaginative creativity and to indulge in the deeply physical and sensual pleasures of life. Beginning at the end of April… and in light of our renewed physical desires… there will be strong celestial support for beauty and healing. Akin to a modern Renaissance period we will begin to witness new levels and highly inspired creations of art, architecture, music and even some creative sciences at the fore. We are being supported to integrate new systems that support uninhibited creation, love and beauty, reconnecting with our bodies again, and working from the sacred connection between spirit & matter…a time to honor our own power…to finally and fully create a beautiful and abundant life here on earth. In addition to all this feel-good stuff, many new gifts of our multidimensional aspects are beginning to pop through, and in some cases are taking us to greater levels of expertise in our known field or talents. These gifts may come as a complete surprise, or may be a part of you that you were vaguely in tune with…either way, they are now surfacing for us to fully explore and share. Planetarily and numerologically speaking… if April is all about stillness & inner exploration, then May will be about stepping further into action. Our inner renewal process will wind-up (after Mercury goes direct) and our outer transformations will begin to solidify…maybe even through the ability to adhere to a routine!…remember what that is? We will continue to have access to really supportive earth energy that is grounding, stable and practical and we should be able to move into a new life-rhythm with greater ease. The new moon last night was a potent (and really painful) blast of energy that is literally pushing us on our new path. This energy can be felt in every cell of our bodies and is restructuring our daily lives on fundamental levels, helping us to create new balanced systems for living…both personally and collectively. From now until July we will have the opportunity and support to continue tying up our loose ends, finish up our healing, resolve any unresolved personal issues and while simultaneously launching the first phase of our new-level lives and creations. See the last 100 energy updates. 1) A great divide will soon be very noticeable in the world and those who are activated and cleared are beginning to hold a very bright light for newly awakening souls. 2) This cycle we are entering is a time of great power… but also great responsibility. Those with pure hearts and minds will feel driven in ways that will uplift and inspire large masses of people during the continuation of great planetary dismantling. It is their wish that those with the gifts of ascended earth use them wisely and consciously to prepare the foundation of a new society based in love, sovereignty and with strong structures of support for the many who will need it. A Call to Bear Light! Wanted to bring your attention to this, I found it fairly shocking. It ties in to my lucid dream two years ago in which I saw plans in progess for earthquake creation. Unfortunately I did not get info re: who is behind these activities; the only thing for sure was — the earthquakes were being planned for execution by a group using military-like means, NOT by Gaia of her own accord. When this video came to my attention about this important station of earth scientists being rendered lame by an attack “from above,” I was called to share it, as I doubt most would see this information otherwise. This development (which actually occurred a few months ago, just before the unprecedented spate of significant quakes) emphasizes our need to crank up every capacity we have to pull as much light as possible through ourselves into the earth plane. There are factions with dark intentions that are desperate to protect their agendas. I feel this destruction of an important warning system for earthquake activity is more evidence of this. The fact that it involved Italian scientists makes it even more poignant to me, as I have also had visions of Italy sinking beneath the sea! Had I not “seen” earthquake plotting in this rather “loud” dream, I might be less inclined to believe stories such as the one presented here. But I feel this reporter is telling it like it is. The transmission quality here is bad — but the information is important. Not to cause FEAR, but to encourage our participation as bearers of energies that are OPPOSITE of these to bring balance (first) to the chaos, and from there tip the scales to the point where ploys like this will not be ABLE to continue; the New Field WILL NOT SUPPORT THIS! And you and I are the ground-crew builders of the New Field. As always, use your discernment when processing information. In my view, we are at the fulcrum at this halfway point through the 6th night of the Mayan calendar. Time to be fearless carriers of light. We’ve got it in us; we were BORN for this. Below the video, I’ve spontaneously decided to post an excerpt from a message I received yesterday, from Mark Kimmel. Mark Kimmel’s messages are the result of communications between himself and beings who are not the indigenous humans of this planet. They detail the situation on this planet, our place in the universe, and a positive picture for our future – if we are willing to act. Mark hopes, by presenting them to you, that they spark your curiosity, and a decision to join with others to create a new civilization on Earth. He encourages you to seek your own unique truth, and live it. Greetings to one and all. I wish to communicate with you this day about the effects of your individual energies on the whole. There is an urgent need to elicit cooperation from as many of you as possible to move the efforts of your brothers and sisters from distant star systems forward. Let me explain. OVER THE NEXT FEW MONTHS, THERE WILL BE A CONCERTED EFFORT TO REMOVE THE INFLUENCE OF THE DARKNESS FROM THE FACE OF THE EARTH. TO ACCOMPLISH THIS, WE NEED THE HELP OF AS MANY EARTH HUMANS AS POSSIBLE. Each effort on the part of an Earth-human to create something that will benefit others pushes the energy of the entire planet to a higher frequency, and away from the slower energy of fear and control. Each effort by an Earth-human to see the larger picture and to tune their individual energy with it shines light into the darkness. On the other side, angry words spoken against the controllers of mankind provide them with more power. Each rally against a government strengthens the current regime and the existing power structure. However, efforts of peaceful resistance, of non-compliance, strengthen the light in all. Your space brothers and sisters have been beaming light to your planet for seventy years. This light has enabled Earth to shake off the overwhelming fear-based controls imposed on her. This light has also enabled people to see the controls imposed on them, to see the lies and misrepresentation, and see that those in charge are not functioning for the highest good of all. The light has enabled people to see the media for the control mechanism that it is. The light has enabled people to see financial institutions and giant corporations as just other methods to control their behavior by limiting their choices while providing profits, to see the medical establishment as limiting their access to real healthcare in the name of making money, and to see the legal establishment as a club dedicated to its own preservation rather than justice for all. The key to unlocking equality, prosperity, and peace is to find ways to shine light into the darkness. Each individual who focuses his or her light on the darkness makes a difference. No one’s effort is too insignificant. Each point of focused energy counts, and it does not require anyone to expose him or herself to ridicule or rejection. It is not necessary to stand before the crowd and speak out; it is only necessary to focus your individual energy on achieving the goal. And what is the goal? The goal of all our efforts is to return Earth to the pristine planet she was before the dark energy enslaved her and her peoples. Once returned to this so-called 4th dimension, Earth will then ascend to an even higher frequency that some identify as the 5th dimension. But before she reaches the 5th, she must cleanse herself from all remnants of fear. We are at a tipping point. These next few months will determine the course of much and of many. No matter how small you may perceive your individual effort to be, your star brothers and sisters notice you. This coordinated effort is the mightiest ever undertaken in this universe. You, the individual souls incarnated on Earth are the focal point of this mighty effort. It is for you and for Earth that billions of beings have congregated about your planet. The darkness has proven to be well entrenched on Earth, perhaps a bit more than had been anticipated, but the relentless showering of energy is making its presence felt. Soon, very soon, the corrupt structures erected by the agents of the dark energy will crumble, making way for a new civilization. Then those of you who have contributed your light will see the results of your efforts. Now is the moment when it is most important to put forth your light. Focus on the new Earth, a new home for humanity, a return to the pristine Earth, and the ascension of mankind into a wondrous place of peace and beauty. Many are asking about new information, some new revelation. There is none. Now is the time to finish what has begun. Now is the time to focus your energies to create a new civilization on Earth. I am Adrial, a celestial of this universe. Thank you Adrial. I am sure that many will heed your call. It is Easter Sunday; my favorite holiday. Besides the inspiring message of one luminous messenger’s ability to negotiate heaven and earth regardless of expectations re: the state of his physicality… it tends to be a time of year for my personal resurrection after long cold months of darkness, often within myself as well as my locale on the planet. Days are longer, birds are singing, flowers are blooming everywhere… what’s not to like? The brain makes more serotonin when sunlight comes in more abundance. Optimism is easier to align with, organically. Often when the body-brain-mind-psyche system has been given a profound stimulus or shock, it becomes capable of releasing many of its old patterns and allowing itself to be pulsed to a different frequency, allowing the emergence of a different human being. I feel this is what’s happening globally, and the ramifications are beyond mind-bending. Jean’s complete essay is here. Meanwhile, may you enjoy your own glorious resurrection, ascension, and eternal life. All are invited to rise. Secondly – I am cutting way down on wireless time. My Macbook is now wired to the satellite modem most of the time, to minimize life-degrading e-pollution bombardment to my already-challenged body/energy. These radiations are harmful. Is it worth the minor convenience of wireless to become a sponge for toxic emanations? IMO – no. At least not most of the time. Thirdly – I don’t use a cell phone for the same reason I don’t go hang out with the gigantic satellite dish on my lawn that says DO NOT STAND WITHIN 10 FEET OF THIS DEVICE right on it. (Never mind that it is RIGHT outside my wall where I sit at my desk anyway!! Gah!!) A cellphone IS a microwave transmitter/receiver that cranks radiation right into the skull. I carry a cell phone for emergencies and quick check-ins, etc, but don’t converse socially or at length on it. Having radiations beam into your belt-line or pocket (and all internal organs in those areas) w/bluetooth doesn’t strike me as all that much of an improvement. Even worse: cell TOWERS. Do.Not.Live.Near. I have a lot of homeopathic remedies on hand. Blended remedies for numerous conditions now are quite accessible… you might check into this modality if you are chronically uncomfortable. Vibrational medicine is helpful if you use it with some consistency. I’ll be the first to admit, I tend to forget about the shelf full of homeopathics (and flower remedies) because their effects are not instantly apparent. When in pain I still tend to reach for a pill that I hope will take it away in 5 minutes… most of which don’t seem to do that anymore anyway. If you feel you are in shock from all that’s going on now (and it can come to this)– try Rock Rose and Rescue Bach flower remedies. Quite helpful is to meditate on your own stability in the storm. Send robust energetic cords from your base down in to the earth… and from your crown out to the galactic center. Once you close this circuit between ‘heaven and earth,’ fill yourself with clarifying, healing photons. Spin your own cocoon of repairing, protective energies thru you and into your immediate area. In this space you can suspend yourself, have some flexibility, and also not get blown away by overwhelming forces (and the fear they can trigger). If nothing else, perhaps you will feel better – if you are among the ‘randomly suffering’ and deeply annoyed at this point (WHAT IS HAPPENING TO ME!!???) – that you are not alone! Just try to keep focusing on it as transient; temporary … and it’s being all for a higher purpose that we can’t truly comprehend at this juncture. Glomming onto these ‘troubles’ empowers them and gives them teeth in the body and mind. Alright, that was my spontaneous prelude to my original comment response, below. Would it help to hear someone say, I feel your pain??? Yes this can all be very harrowing. We don’t really know what all is happening to us, and moreover… some are feeling these energetic shifts *acutely* in their bodies, while others feel nothing at all different is happening in the world. Tennis, anyone? And then there’s the matter of people getting ’slammed’ physically at various TIMES; this isn’t like we all feel the same temperature, or rain, or other mundane weather conditions. We are all built according to very personal “specs,” one might say… all with our very specific packages of DNA and embodied karma… one size just does not fit all in any sense when it comes to what is going on now! So it’s hard to make sense of it! Funny: I’m reminded suddenly of a sweatshirt my mom got me as a kid… it had a pic of Lucy from Peanuts on it, w/her mouth wide open yelling “I’m frustrated, inhibited, and nobody understands me!! !” (I think maybe Mom was a prophet ;) It’s this conception of being ‘the morphing oddball’ that I attempt to assuage by putting some of my personal weirdness out on this blog! Some of this stuff is agony; some is crazy-making… but it IS HAPPENING, as mysterious and slippery as it all is. My joints too, recently went thru a stage where they screamed–Don’t make me move!!! I couldn’t believe the acute pain coming from so many places, some very mysterious — not the typical muscle/tendon/organ etcetc ‘targets’ for trouble. All I can generally grok is, we are like rusty vehicles that are undergoing a complete transdimensional sonic-blasting by very high energies, for lack of a better analogy. The centuries of rust are getting blasted away. Energy surgery can hurt, apparently! Especially for the more ‘classic’ models of human vehicles. The younger ones seem to be coming in with DNA already prepared for what’s going on now. Also, since we are being ‘irradiated’ by cosmic forces… our cells are padding for their own protection. Having every cell holding fluid like a pregnant little momma to cushion the blow can make a body feel odd – “crowded,” bloated, perhaps contributing to pain or overall discomfort. The organs, too, are having much to contend with… and when something triggers or challenges one organ… its changes cascade into the others, making for all kinds of ‘surprises’ in our bodies. When you zoom out your perceptual lens to take in the frankly unimaginable event in process here… all the smaller creaks and groans coming up in all the ‘little ships’ bobbing around in the cosmic sea (being us) during these energetically stormy times seem reasonable par for the course. All we can really do in response is keep our compasses on true north (the great central sun, the source creator, etc) and trust the intermittent misery is transitory… and something beyond our sweetest dreams lies ahead! To cast our consciousness to pools of clarity, calm and comforting sparkling light can help energize peace within the body (clean eating also highly helpful) … focusing on the pain can amplify the misery… I know this as well as the next person! YOU ARE A POWERFUL CREATOR WHO IS PROFOUNDLY LOVED. Try returning your thoughts to this premise when you start feeling a bit off your optimal course.